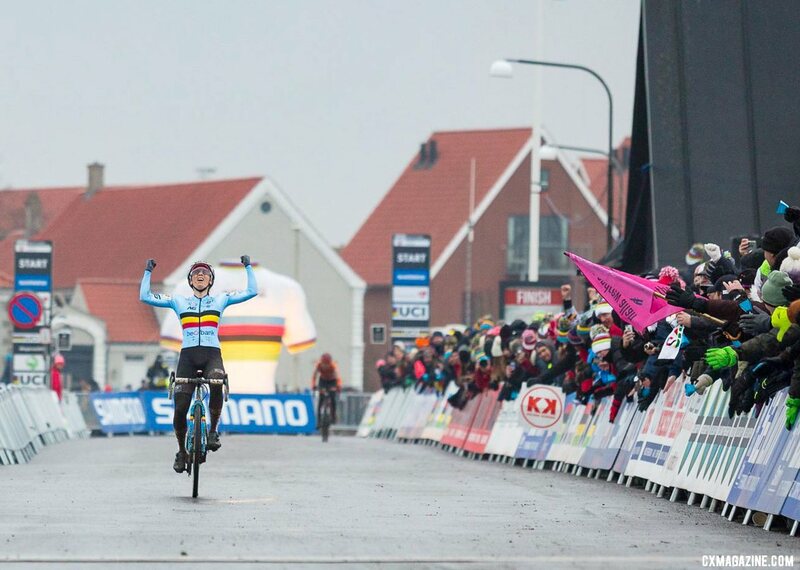 The Elite Women’s race at the 2019 Cyclocross World Championships was anything but a coronation for Sanne Cant, who was racing for her third-straight World Championship..
After a 2017/18 season where she was the most consistent female cyclocross racer, Cant headed to Bogense with only seven international wins in 2018/19. There, she faced off against an incredibly talented Women’s field ready to take away her rainbow stripes. Betting again Cant in a big race, however, is probably a mistake. The now-three-time World Champion stared down four Dutch riders and dropped them in the penultimate lap to take a six-second lead at the bell. With the breakout star of 2018/19 Lucinda Brand hot on her tail, Cant delivered a perfect last lap to win her third-straight World Championship and cement her status as one of the sport’s all-time greats. Cant rides for IKO – Beobank, which is the development arm of Mathieu van der Poel’s Corendon – Circus program. A day after Cant’s triumph, Van der Poel joined his program-mate in the rainbow stripes. As we noted in our profile of Cant’s bike earlier this year, although both teams are under the direction of the Roodhooft brothers Christoph and Philip, they each ride different bikes. Last week, we took a Worlds look at Van der Poel’s winning Canyon Inflite SLX. Cant rides a Stevens Super Prestige. In November, we spent some time at Superprestige Gavere with Cant’s Super Prestige decorated to celebrate her first two Worlds wins. 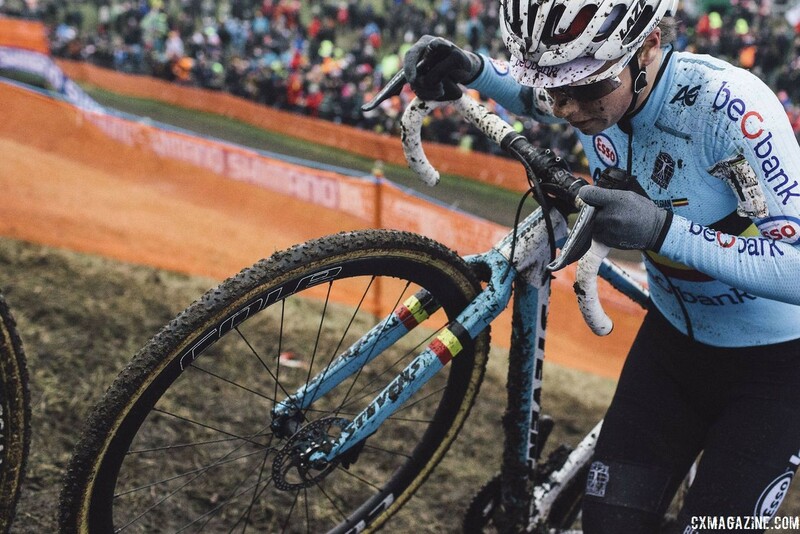 At Bogense Worlds, she rode a new Belgian Champion’s frame accented by Belgian blue and the colors of the Belgian flag, which helped her stand out in the sea of orange with her at the front of the Elite Women’s race. For this special Worlds bike profile, we look at Cant’s triple-rainbow Stevens Super Prestige. 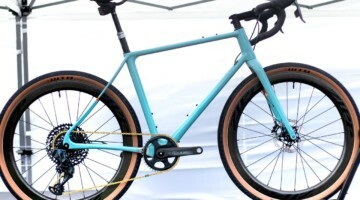 The Stevens Super Prestige Cant rides needs little introduction. 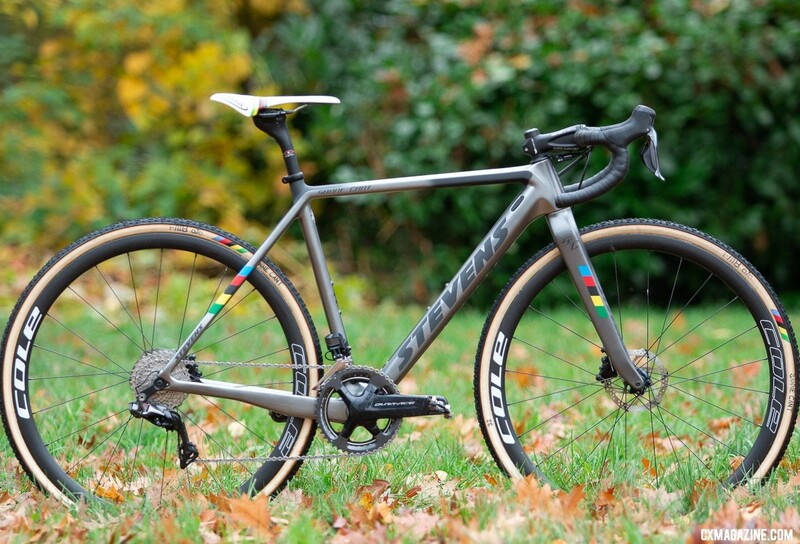 Formerly raced by Mathieu Van der Poel and currently piloted by Wout van Aert, spectators have grown accustomed to seeing the bike at the front of European cyclocross events. We also profiled Cant’s bike last season in Iowa City. During the 2018/19 “regular season,” Cant had two Stevens Super Prestiges in regular rotation. One is the muted graphite frame we photographed at Superprestige Gavere. Her other bike, which we photographed earlier this year at World Cup Waterloo, is black and white with gold lettering. 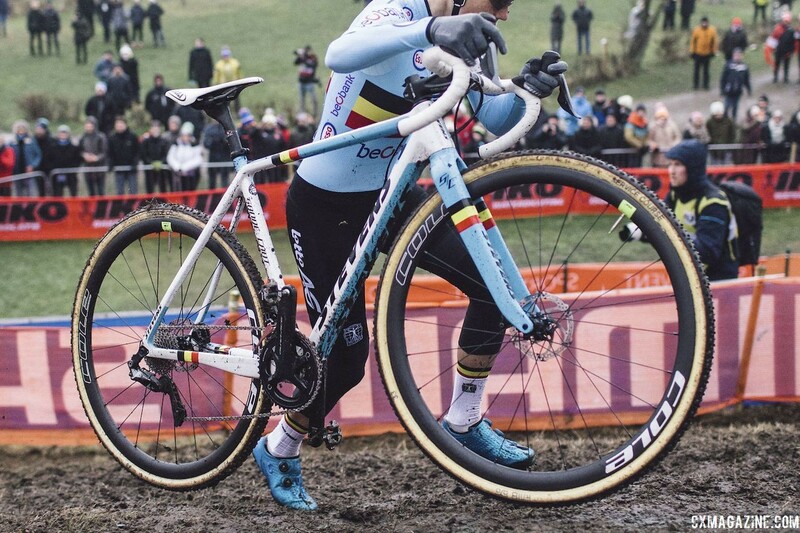 At Worlds, she added a third paint scheme to honor her 10 straight Belgian National Championships. It features the Belgian flag on the fork, chainstay and top tube and Belgian blue on the fork and mixed in on the rest of the frame. 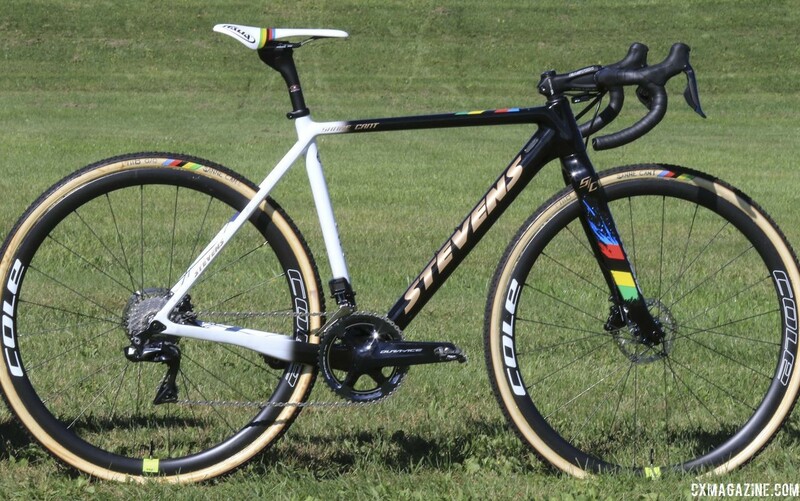 Although her Worlds paint scheme was new, Cant’s bike was still built similar to the one we saw at Superprestige Gavere. Cant’s Super Prestige features flat mount brakes, a tapered head tube and internal cable routing and is built up with parts from Shimano and Easton. 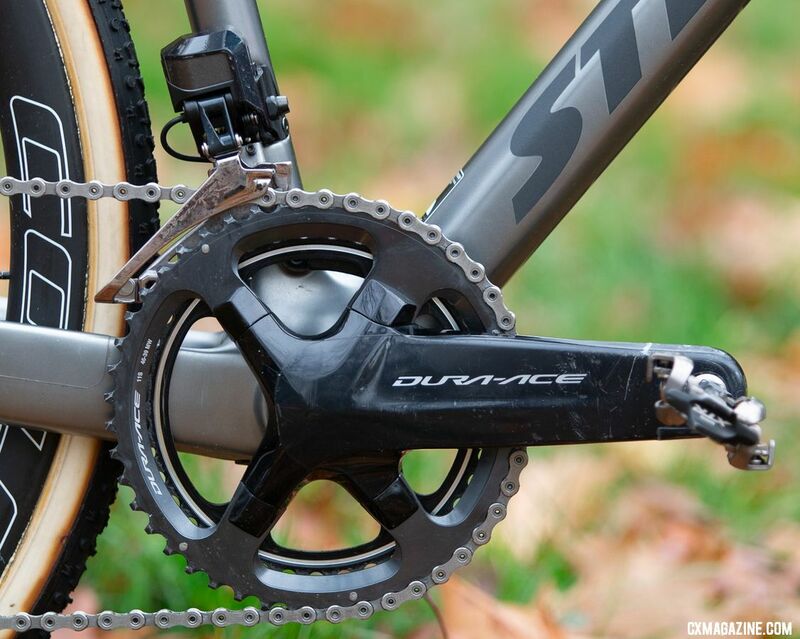 Her shift/brake levers were the top-of-the-line Shimano Dura-Ace R9170 Di2 dual control levers. Like many Shimano-sponsored riders, she ran a 2x setup with a Dura-Ace crank, R9150 derailleurs and Dura-Ace chain rings, even though we are seeing other European riders on both Shimano (Eli Iserbyt)—and now SRAM Red eTap—running 1x systems. 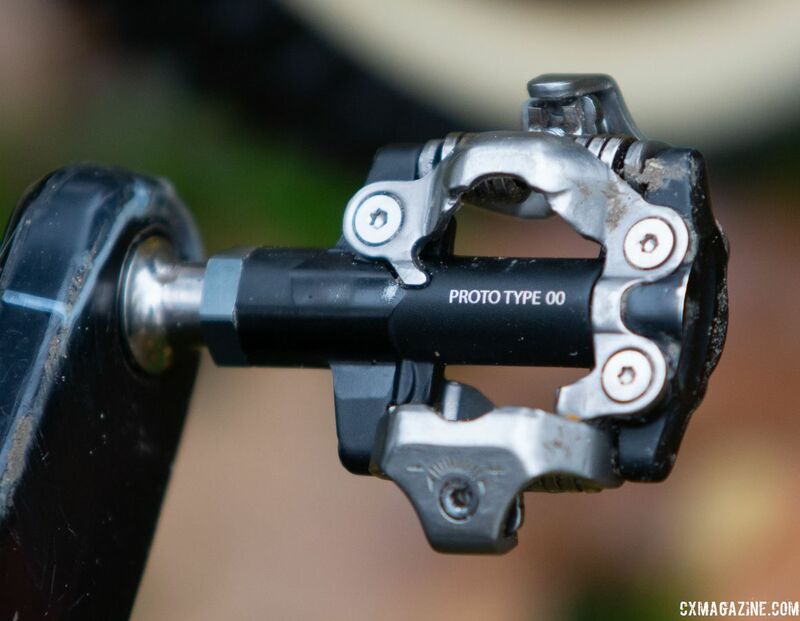 The last time we checked in with Cant, she was using an older version of Shimano’s top of the line XTR pedals. While still not up to date given the recent M9100 launch, Cant has now upgraded to M9000, which has a larger support platform than prior versions of the pedal. She did not run the prototypes we saw on Van der Poel’s bike. 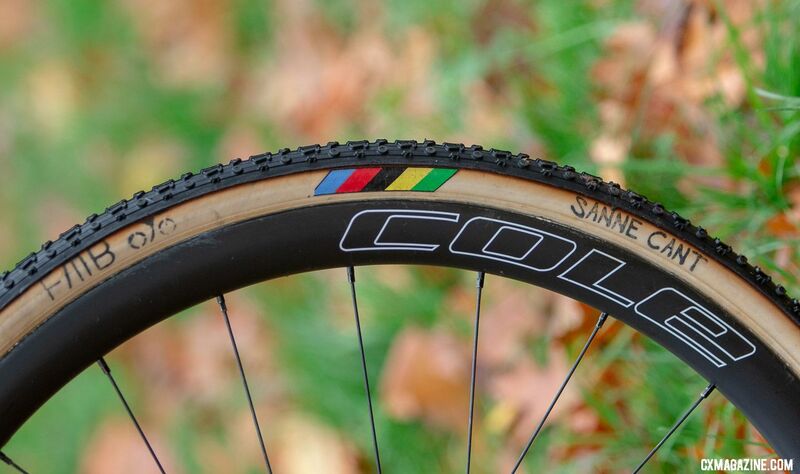 Team sponsor Cole provided Cant with T38 CX carbon tubulars which have 24 spokes front and rear. 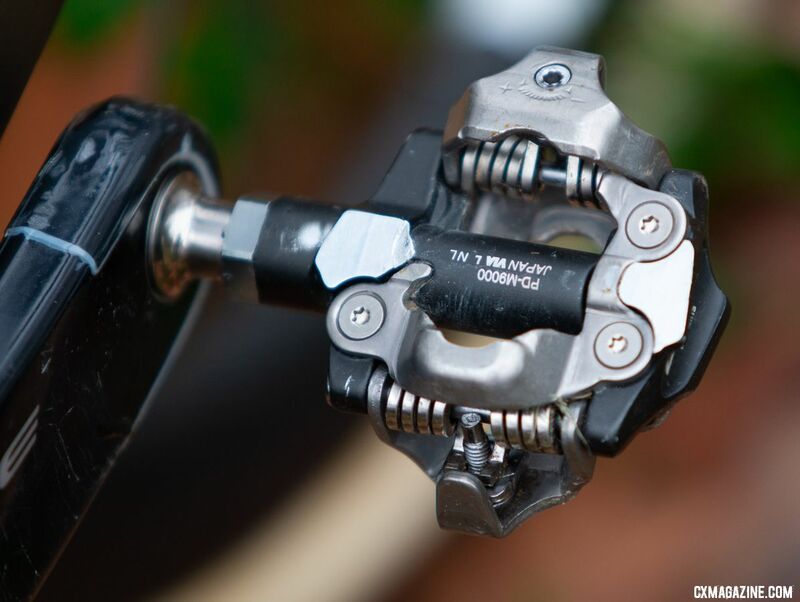 The house brand hubs feature 6-bolt rotor mounts and Cant has chosen rotors from TRP in 140mm front and rear, even though Shimano has 6-bolt options available. Like many European riders, Cant does not have a tire sponsor and chooses her own tires. 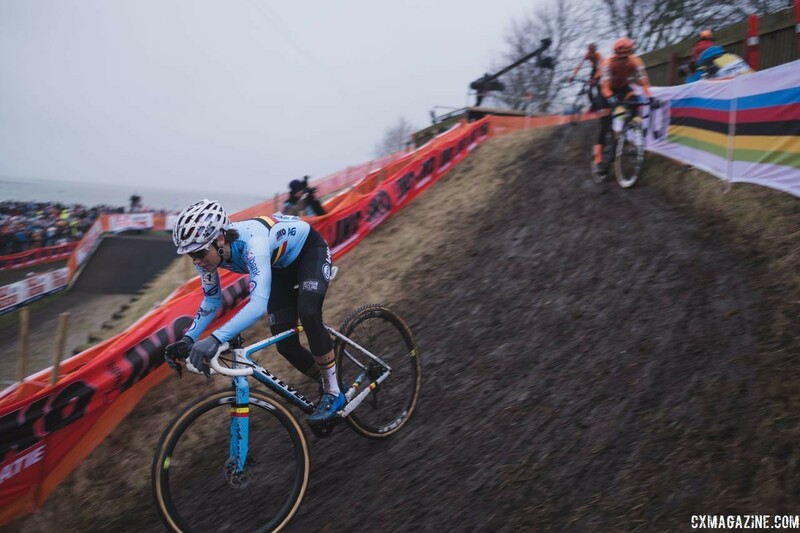 Although the Bogense course was largely frozen during Friday’s course inspection, on the day of the Elite Women’s race, a steady drizzle started to fall before the Saturday finale. To handle the increasingly sloppy conditions, Cant ran FMB Grippo Speed tires, which we also saw her with at Gavere. 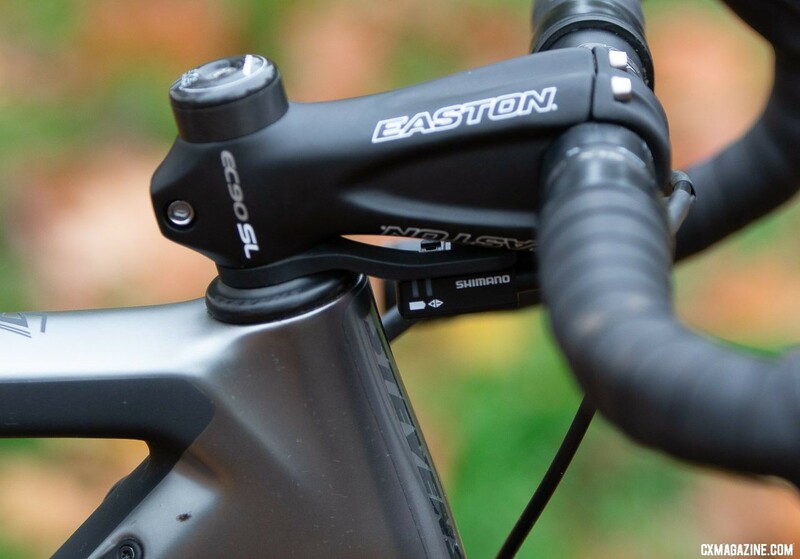 Easton supplied the majority of Cant’s cockpit, with a carbon EC90 SL stem, EC 90 SLX handlebar and EC90 seatpost. Eschewing the usual strap mount, Cant’s EW90 A-junction is secured using a spacer mount below the stem. Sponsor Selle Italia provided Cant with a custom SLR Kit Carbino saddle which, like her frame, pays homage to her World Championships victories. 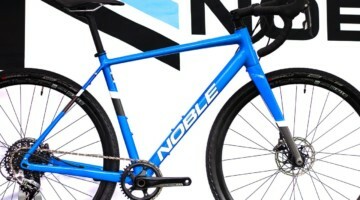 For more on Cant’s Super Prestige, check out the photo gallery and specs below. For more from Bogense, see our 2019 World Championship archives. Our coverage of the 2019 World Championships has been sponsored in part by Easton Cycling. This article features contributions from Brandon Grant and Zachary Schuster. Next post Scotland to Host Mega World Championships in 2023, Will Cyclocross be Included? How come she rides a different bike than the men’s team? IKO-Beobank is Corendon-Circus’ development team. They have different sponsors (including bikes). Corendon-Circus actually switched from Stevens to Canyon starting in 2018, so MvDP had to switch bikes in the middle of the cyclocross season last year. A different question is why does she ride for the development team and not the elite team, like Ceylin del Carmen Alvarado? Anyway, that Belgian colors bike is unbearably pretty.